In a city monopolized by concrete, stone and steel, the hybridization of organic and modernist styles gives warmth and adds an opulent dimension of distinction. Architect Eran Chen, founder of ODA New York, recently said in an interview that he believes that private gardens will soon be an expected amenity in the city. “There’s going to be a time in New York City where living without a substantial outdoor space is just going to be unacceptable. It’s going to be like living in the suburbs without a backyard,” said Chen. 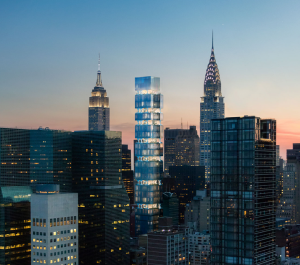 Eran Chen is the architect for the stunning new residential condominium development that will be erected in Midtown East at 303 East 44th Street. The slender, 600-foot-tall glass tower features floors separated by 16-foot gaps that are supported by elegantly sculpted concrete columns. The gaps between every two floors create private outdoor gardens for 11 of the residences, starting on the 23rd floor. 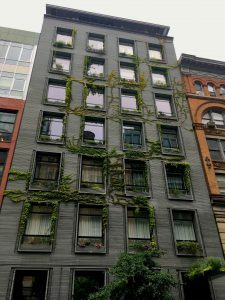 Architectural firm DDG Partners has designed several striking residential structures in NYC that incorporate vegetation onto the façades including 41 Bond Street and 345 West 14th Street. Conceived by DDG Partners, the façade of 345 West 14th Street features hand-laid Kolumba brick and is distinguished by a striking, concrete landscaped marquee. The entrance marquee at 41 Bond Street is rife with vegetation. Attenuated strands of green foliage ascend the structure while delicate vines asymmetrically stretch against the bluestone façade. The biophilic design of living façades reconnects the observer to the natural world and provides ecological improvements. A stunning example is the smog-eating tower that will soon go up in the Netherlands city of Utrecht. The skyscraper’s façade, balconies and roof will be filled with 10,000 trees and shrubs—nearly half the amount found in Central Park in New York. 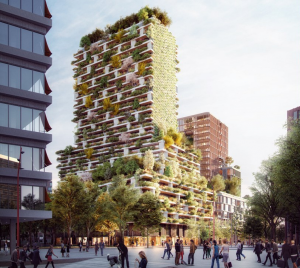 Called the Utrecht Vertical Forest, the 300-foot-tall tower, designed by Italian architecture firm Stefano Boeri Architetti, will feature approximately 30 different plant species. The tower will produce about 41,400 tons of oxygen annually, roughly the same as what 2.5 acres of forest generates. The building will include 200 luxury apartments, restaurants, a fitness center, and offices. 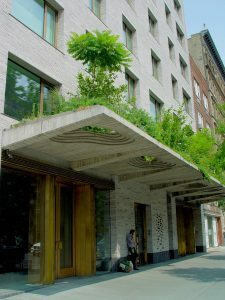 This entry was tagged 303 east 44th street, 345 West 14th St NYC, 41 bond street nyc, architecture nyc, DDG Partners, dickse fitzgerald, Eran Chen, luxury real estate nyc, new trend nyc real estate, nyc real estate trend, ODA, Stefano Boeri Architect, vegetation on buildings. Bookmark the permalink.